Very high energy gamma ray map of HESS J1458-608. The black contours show detection significance of 5 and 7 sigma. The position of the pulsar PSR J1459-60 is marked by green and red filled squares, which correspond to Fermi/LAT and Suzaku best fit position, respectively. The inset shows the point spread function of the H.E.S.S., with the same smoothing as applied to the data. Among the population of Galactic very high energy gammma ray sources, pulsar wind nebula appear to be the dominant source class, see e.g. Kargaltsev and Pavlov (2010) for a compilation. With the discovery of new pulsars e.g. by Fermi (Abdo et al. 2009), more previously unidentified very high energy sources are identified as electron-positron nebulae driven by pulsars. One example of a recent discovery is the very high energy gamma ray source HESS J1458-608 (top image). A first marginal detection was achieved in the H.E.S.S. Galactic Plane Survey carried out since 2004. Dedicated follow-up observations in 2009 and 2010 clearly established extended emission, at a significance of about 8 standard deviations. The (Gaussian) width of the emission region is about 0.17 degr., well resolved given the angular resolution of the instrument. While there is a hint of additional structure - possibly a second source hidden in the tail of a dominant source - this is not statistically significant with the current data. HESS J1458-608 has a flux of about 6% of the Crab Nebula flux and a power-law spectrum with index 2.8 extending beyond 10 TeV(Fig. 1). While H.E.S.S. data were analyzed, Fermi reported detection of the pulsar PSR J1459-60 in GeV gamma rays (Abdo et al. 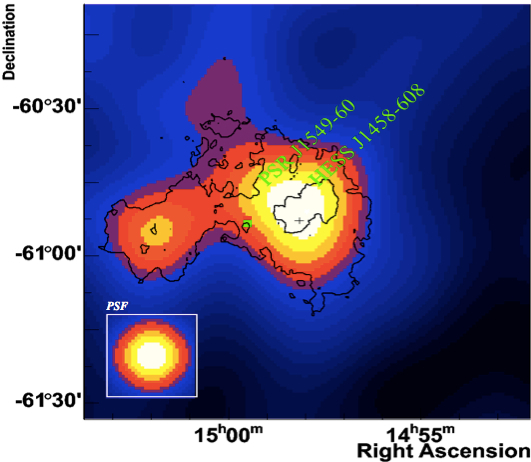 2009, 2010), followed by detections in X-rays by Suzaku (Kanai 2010, Ph.D. thesis) and Swift (Ray et al. 2011). PSR J1459-60 is located about 10' from the peak emission of the H.E.S.S. source. The pulsar, at an estimated distance around 4 kpc, has a period of 103 ms, an age around 60 krys, and a high spin-down energy loss of almost 10^36 ergs/s. The luminosity of the H.E.S.S. source, at an assumed distance of 4 kpc, corresponds to 2% of the pulsar spin-down energy loss, well in the range of other pulsar wind nebulae. The 10' distance between pulsar and H.E.S.S. 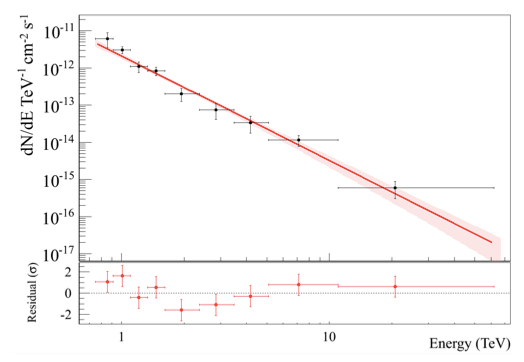 source translates into a 11 pc, again well within the range of offsets observed for other pulsar wind nebula (Fig. 2), and explained e.g. by a pulsar velocity of about 200 km/s, moving away from the pulsar birth location and leaving a nebula of relic electrons behind, most of which were generated when the pulsar was young and spin-down losses were even higher. Absence of other mechanisms to explain the very high energy gamma ray emission, such as molecular clouds detected in radio, make the emission by pulsar-generated electrons scattering off ambient photons the most plausible scenario for HESS J1458-608. Reference: "A newly discovered VHE gamma-ray PWN candidate around PSR J1459-60", H.E.S.S. Collaboration, R. de los Reyes et al., Contribution to the 32nd ICRC, Beijing, China, August 2011, and arXiv:1205.0719. Fig. 1: Energy spectrum of HESS J1458-608. The bottom plot shows residuals relative to a power-law fit of the data. Fig. 2: Offset (in pc) between the X-ray and the TeV emission for a population of pulsar-PWN systems as a function of the pulsar age (spin-down age). 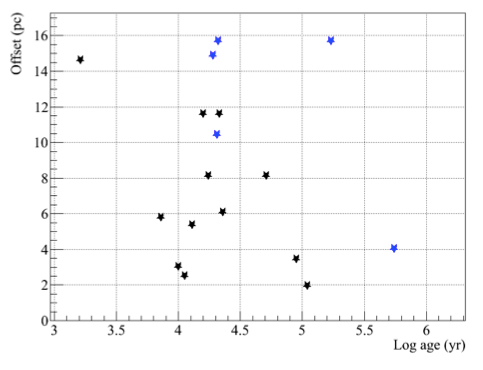 The black points correspond to those sources with X-ray emission detected while the blue points to those which X-ray emission is faint or nonexistent. Based on Kargaltsev and Pavlov (2010).